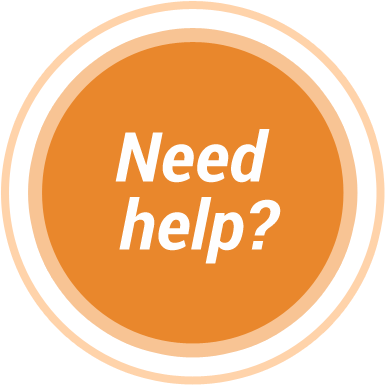 If you have any questions and would like to speak with customer service, you can contact us. What languages does TranslationPal offer? Ordering is easy and convenient! Simply select your turnaround speed, enter your word count, and then upload your document. Then you will be taken to our contact and billing information page. After entering the necessary information click the confirm order button and you're finished. We accept phone orders at 855-500-2720. Our customer service specialists are available every day 8 a.m. to 10 p.m. CT to answer your questions. We'd love to talk to you! We offer as fast as 10-hour turnaround. If you need your order before the turnaround time you selected, please call customer service at 855-500-2720 during live customer service hours. Our live customer service hours are every day 8 a.m. to 10 p.m. CT. We will do everything we can to accommodate your request. Orders can be placed online using PayPal, Visa, MasterCard, American Express or Discover Cards. Do you have a minimum order or word count requirement? TranslationPal has no minimum requirement for the number of words in your document. However, we do have minimum order charges starting as low as $19.97 for 5-day turnaround. We use your birth date as the password for you to use to download your document when your order is complete. We also use your birthdate so that we can send you a Happy Birthday message on your birthday! TranslationPal charges on a per-word basis. The rate varies based on the turnaround time you require. See the table below for more information. How is the number of words measured? We count the number of words in the source document - for example, if you are translating a document from German to English, we will charge based on the number of German words in the original document. What turnaround speeds do you offer? For any document over 3500 words please contact us at 855-500-2720 or e-mail us for a custom quote. What is a certified translation, and why do I need one? A certified translation is a document accompanied by a statement from TranslationPal swearing that the individual who performed the translation and that said translation was done to the best of their ability. Certified translations are required by the United States Citizenship and Immigration Services (USCIS) for visa and citizenship applications, as well as by other government agencies, the court system, and educational institutions. By submitting a certified translation, you satisfy their need to know that a document has not been altered or forged during the translation process. Does TranslationPal provide certified translations? Yes. We provide 100% guaranteed certified translations. How will the English version of my certified translation (birth certificate/marriage certificate/diploma, etc.) be formatted? As this type of document is typically submitted in PDF format as a scan of an existing paper document, TranslationPal is unable to guarantee that all features of the original document will be reproduced as-is (e.g. stamps, tables, etc.). You will receive a final document on TranslationPal letterhead in a format that can easily be compared to the original and understood as a translation. For a sample certified translation, please click here. Will I get an e-mail confirmation after I place my order? Yes, you will immediately receive an e-mail confirmation of your order. Will you notify me when my document is ready? Yes, you will receive an e-mail as soon as your order is completed. Please verify your order confirmation immediately upon receipt to verify the details of your order. You may make changes or cancel your order as long as the order is not in processing. We strongly suggest you speak with a customer service representative as soon as possible with changes or cancellations, so we can accommodate your request without any additional charges. Live customer service hours are every day 8 a.m. to 10 p.m. CT at 855-500-2720. If an order is in processing, no changes can be made. 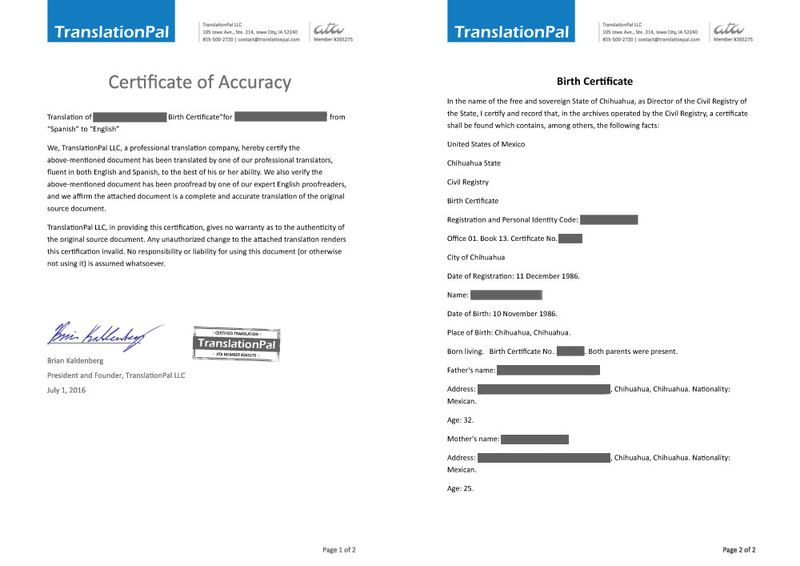 Every single document submitted to TranslationPal is translated by one of our highly skilled staff members and then proofread by a second staff member. Our two-tier model is central to our mission of providing the highest quality translation available. We offer a 100% satisfaction guarantee. If any TranslationPal job does not meet your expectations, please contact us at 855-500-2720, and we'll work until you're satisfied or refund your payment in full. Credit will be issued 2 to 3 business days after we receive and verify your refund request. Please allow adequate time for your banking institution to process the credit. What if I received my order, but some information is incorrect or missing? Please inspect all documents carefully when you receive your order. If there is any missing or incorrect information, please call our customer service representative at your earliest convenience, but no later than 7 days after your order was delivered. Live customer service hours are every day 8 a.m. to 10 p.m. CT at 855-500-2720. How are your translators chosen? We have a rigorous multi-step process for selecting translators. Translators must first fill out an application. 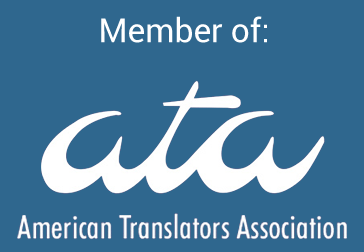 If their credentials are sufficient, qualified translators are then invited to take a short translation test, and senior members of our translation team evaluate the sample translations, selecting only the top scorers to become part of our team. Are all of your translators native English speakers? Yes, we require all translators to be a native speaker of the target language. What do "source" and "target" language mean? The source language is the language of the original document. The target language is the one you are translating into. For example, if you are translating a birth certificate from Spanish into English, your source language is Spanish and your target language is English. TranslationPal uses a two-tier translation process. First, one of our expert translators will translate your document into English; the document will then be revised carefully by one of our experienced proofreaders to ensure it is error-free, easy to read, and correctly formatted. Click here to learn more about our translation process. I have previously translated some documents. Can TranslationPal leverage my existing translations? Absolutely. TranslationPal understands how important it is to maintain consistency in terminology, style, and branding. We are happy to leverage existing translations - just provide us with a translation memory export (.tmx file) that can be used with our translation software. What is the difference between machine translation and translation software? Are they the same? No. Machine translation - such as Google Translate - is used to automatically translate words and phrases based on a database of previous translations. Translation software - known in the industry as computer-aided translation (CAT) tools - is used by human translators to accelerate the translation process, ensure consistency within or across documents, and perform quality control checks. TranslationPal's team of human translators uses translation software to provide our clients with the fastest, most accurate service possible. We do not use machine translation. Does TranslationPal use machine translation? No. TranslationPal relies exclusively on its team of highly qualified human translators, who have significant experience speaking the source language, as well as excellent English skills. In addition, each translation is reviewed by one of our expert proofreaders. Why should I hire TranslationPal to translate my documents? Can't I have a bilingual friend or colleague do the work for me? Professional translators can save you time and money with their efficiency and experience. In addition, you'll benefit from TranslationPal's experienced team of proofreaders, who review each translated document with a critical eye, looking for typos, grammatical issues, and style. All the information you provide, including your credit card information, is secured using Secure Sockets Layer (SSL) encryption technology. We use SSL technology to prevent your information from being intercepted and read as it is transmitted over the Internet. We request your e-mail address so that we can e-mail you an order confirmation. We request your phone number to contact you in case we need to give you an order update. Rest assured, we never rent or sell your contact information to anybody, for anything.